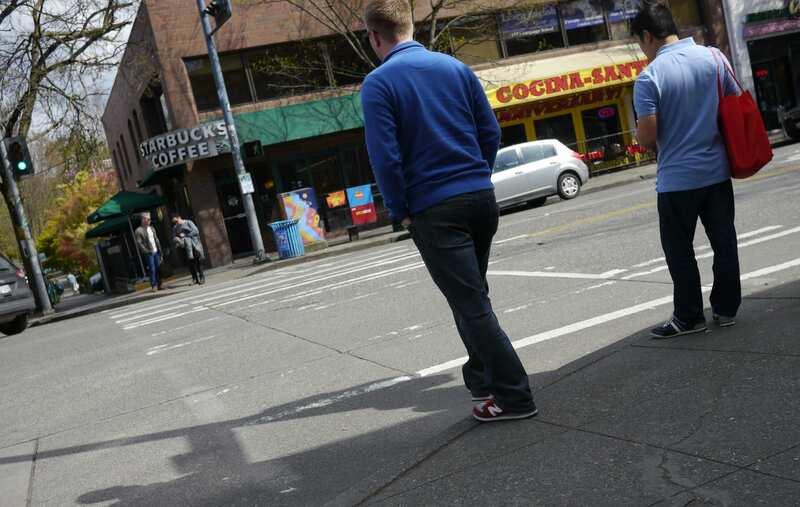 They crossed Broadway from QFC hoping to get some corporate coffee or lunch from a a 35-year-old Mexican restaurant. Instead, they ended up in 1937. Those years of the Great Depression were the only time that Capitol Hill joined downtown, Ballard, the U-District and other neighborhoods to form the City of Clocks. Seattle had dozens of street clocks. Many, like this one in front of William Cobb’s jewelry shop, were made by Joseph Mayer, Seattle’s clockmaker. 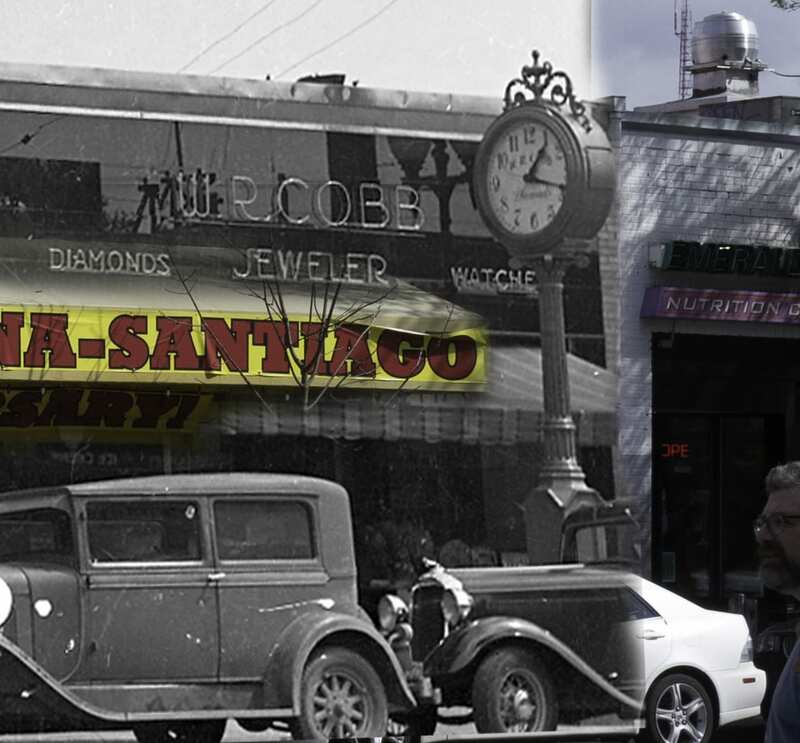 Cobb got a permit to place his clock in the sidewalk in 1931 at 522 Broadway N, then moved here a block south in 1936. In 1935, he was described as having been in business for 40 years in Seattle. But really he had a shop in Tacoma from the 1900s to early 1920s, then moved to Seattle and went to work for jeweler Peter Michael. My friend Paul Middents and I have been tracking every street clock ever in Seattle, which is even more challenging than it sounds. So far we don’t know where Cobb’s ended up. I’ve got six lonely entries in my database for Cobb, ending with this assessor’s photograph. He died in 1940, and presumably the clock was purchased at auction and left for other shores. Contrast that with Peter Michael’s clock for example which has 38 entries of photographs or documents and a clear paper trail to Johnson Jewelers in Puyallup. Our contemporaries left the curb hungry though, so let’s turn our attention to the two-story structure on the corner. It was built in about 1906, originally a residence over business. 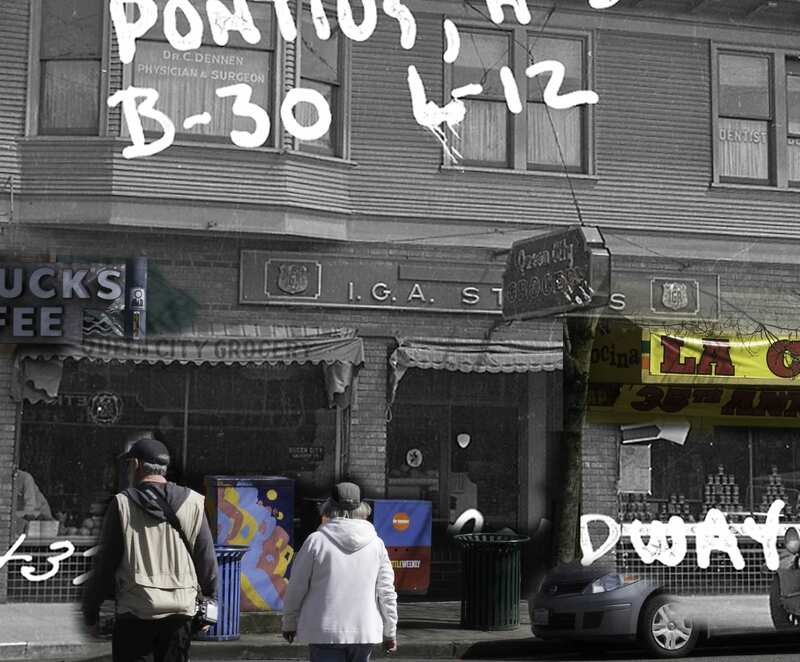 Downstairs was Queen City Grocery, owned by partners John Nelson and Magnus P. Lindros. For the first few years Nelson lived upstairs, and later they rented out the second floor. Nelson stayed close, moving to a boarding house where Corona Apartments is today at Republican and Belmont. Lindros also lived nearby at 10th and Prospect with his family. They moved a block over on North Broadway to make way for the Volunteer Park Apartments in 1917. Lindros was a Swedish immigrant who moved to Seattle in 1906 from Chicago with his wife Carrie and three children Esther, Josephine and Stanley. Stanley joined Queen City in the early 20s and worked as a meat packer during the Great Depression, carrying on his father’s trade. There appear to still be descendants of all three children in Seattle today: Lindroses, Heuples and McKinneys. Perhaps one of them knows why Magnus Lindros, Chicago piano maker and cabinetmaker, moved his family to Seattle to start a grocery. Lindros had a passion for the business, though, taking a leadership role in Seattle’s grocery scene. He served as president of the Seattle Grocers’ Association and vice-president of the state association. In 1928, Lindros and Nelson sold the store. It’s difficult to track Nelson because there were so many Swedes named John Nelson in Seattle, and because he apparently never married. Lindros moved to Mount Baker and opened the York Grocery. His wife worked at the store until her death in 1937, and he joined her in 1949. The new owners of Queen City were Charles Thorp and his wife Johanna, who listed her role as bookkeeper. Thorp was striking out on his own after working for many years as a clerk for Harrah Brothers, a two-store grocery firm located at Broadway and Roy and at 19th and Aloha. After 1929, independent grocers faced immense financial strain during the Great Depression and as a result many cooperatives and bargaining associations took off in Seattle. Examples include PSQ (Price Service Quality) Grocers, Red & White, the Grocers’ Cooperative Association, and the Shop-Rite and Reliance Food Stores that were in Broadway Market. The association relevant to our story was the Independent Grocers’ Alliance (IGA), which was founded in 1926 but first arrived in Seattle in 1933. Food distributor American Wholesale Grocery set up a model IGA floor plan inside their warehouse for grocers to inspect. 200 grocers attended the first meeting of IGA, but it was Thorp’s Queen City Grocery along with Frost & Son at Summit and Mercer and a store in Greenwood that were the first three IGAs in Seattle. Now the Kress IGA downtown is the last one within the city limits. Queen City operated into the 1950s, perhaps until 1962 when Peter Oos opened Peter’s on Broadway, presumed to be Seattle’s first openly gay clothier. The second floor space was converted to business use before the 1937 photo was taken, with signs visible for a physician and dentist. But by the 1960s it was again housing. In 1976, Paul Dorpat moved into the upstairs unit. Okay, let’s pause. If your heart already skipped a beat, you can skim down to Paul’s quotes about living at Broadway and Republican. Everyone else, read this. 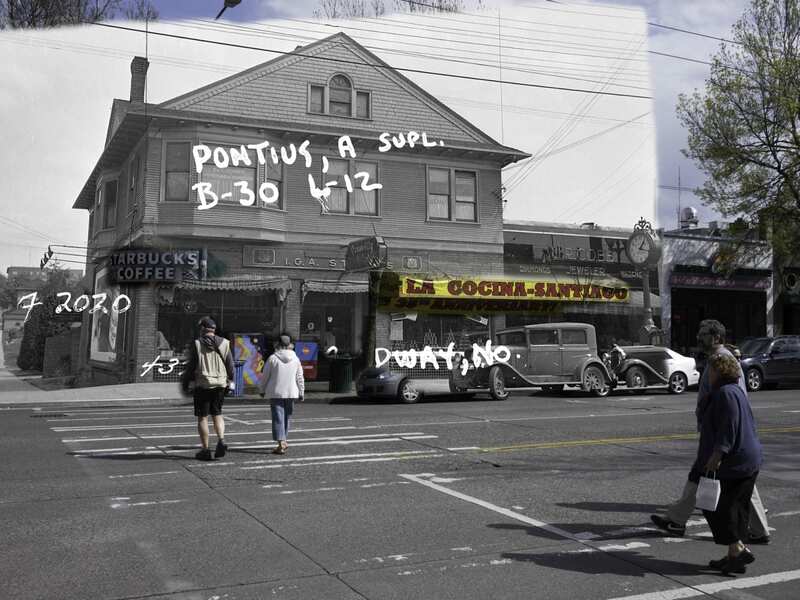 Paul Dorpat is the 800 pound gorilla of Seattle popular history. If you haven’t heard of him, this is your initiation. In 1976, the same year he moved over Peter’s on Broadway, Dorpat began “studying local history… concentrating on its photographic evidences.” That eventually led to the magazine-book (in Japanese these are called “mooks”, can we start using that?) 294 Glimpses of Historic Seattle and its Neighborhoods and Neighborhood Businesses, funded by a federal CETA grant and published by the city’s new Seattle Arts Commission in 1981. 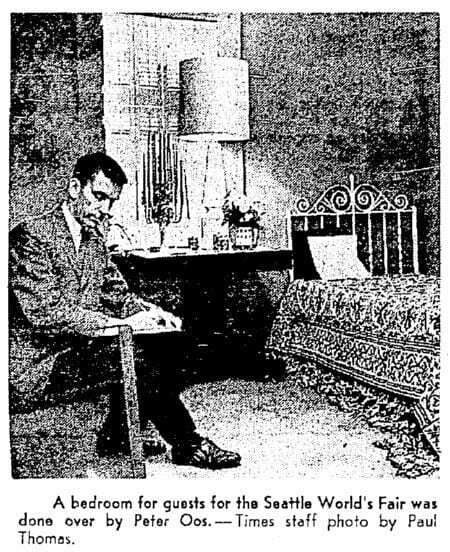 In 1982, Dorpat began his weekly Seattle Now & Then column for the Seattle Times. It’s now old enough to drink, and crested the 1,000-article mark way back in 2001. He’s published a number of mooks and books and now has a ridiculously good website that expands on the bounded word count in the Seattle Times. “For seven years he has searched for the old photographs. They have come alive for him, these pictures of buildings torn down before he was born; these dirt roads now replaced by jammed downtown streets; these nameless people posing awkwardly in their Sunday clothes. They obsess him. “‘I’ve looked at many thousands of pictures. I’ve looked through the entire Northwest Collection at the University of Washington. I doubt anyone has done that,’ he said. I went looking for a photo of a clock, and I ended up seeing much more. I found the home of Paul Dorpat as he set out on a quest that would inspire me, 30 years after he left it, to begin my own series of adventures. It was his life’s work that inspired me to write this for you. About the only extant street clock that I am very familiar with is the one on Pike Street just outside Ben Bridge jewelers. Fascinating article. Thanks! There was one more landmarked clock that escaped the city. Plus, the clock at Menashe jewelers in West Seattle has been beheaded a couple of times but components of it date back to the 1910s. So there are 9ish historic street clocks. I’ve got this kind of out of control site on Seattle’s clocks that you might be interested in, http://www.zombiezodiac.com/rob/ped/clock/ . Most of my clock energy over the last few years has been focused on the database (which I plan to share soon) and helping my friend Paul research his book on Joseph Mayer. Recently we had an amazing breakthrough, and we now know the history of the clock on Dexter. Thanks for a great article and fond memories. As a (barely) 18 year old gay boy living on Capitol Hill with my family in 1971, memories of sneaking into Peter’s (what if neighbors see me!) and scoring a Helix paper and an After Dark magazine, kept me enthralled for days. It’s so rewarding to tell a story that touches someone personally, and rekindles old memories. I need to restate that — Paul Dorpat has been posting full scans of the Helix as pdfs. Click on the cover image to see the paper. Rob, thanks for the story – and for the salute to Paul Dorpat. I have a number of friends who lived above and behind Peters back in the 70’s. Cornish was a huge artist-magnet then. Out of curiosity, when did the “North” addresses around Broadway become “East”? I’ve seen a few old signs (e.g. the letters inlaid into concrete at Thomas & Belmont) that still use the “N” suffix. I got a prescription bag from the larger QFC labeled “417 Broadway N” last week. This does not answer your question about the “old” street directional but does address how the directionals work today. Jason, that happened in 1961. How on earth did QFC get it wrong 50+ years later?? QFC’s earliest roots were in 1955, but there’s no way their prescription system dates back that far. I wonder if it was a hand-written mistake, an honest error by your doctor, or if they purchased some bad map data at some point. Thanks so much! The incorrect address is preprinted onto their small waxy prescription bags. I’m guessing this is just a typo since that QFC is nowhere near 54 years old. I wonder if it’s an intentional typo to help the employees remember which QFC is which. Broadway “N” is north of the other one. This is one of the greatest joys of studying history… the coincidences that take us by surprise. Great article. 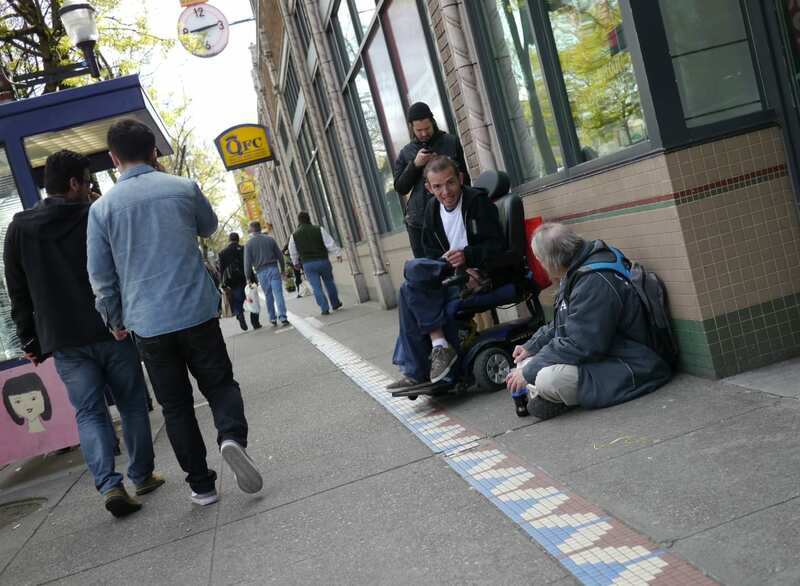 Paul Dorpat is a living treasure for Seattle, and Robert you are a close second! Too bad that clock isn’t still there today. Excellent article. Great links. Thank you!